On opening day, Oct. 9, worshippers at the new Edmond satellite of St. Luke’s United Methodist Church — 754 strong — sang "What a Friend We Have in Jesus" just as the saints of the church did 127 years ago on founding Sunday. 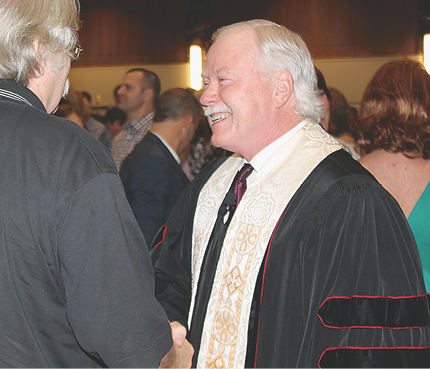 Consecration Sunday was followed by the Grand Opening on Oct. 16 — and the number of people swelled to 1,350. St. Luke’s senior pastor, Bob Long, preached on "game changers" Oct. 9, including the first woman to complete the Boston Marathon and the biblical Esther, a Jewish orphan who became a queen. "I can’t help but wonder if God brought you to this place for such a time as this," Rev. Dr. Long said. "I think of the risk, but maybe God was giving us a vision of a new way to share God with the world. "There is a joy that comes when you are working together. We love the statement: ‘Wouldn’t it be great if …’ And then we fill in the blank." Bishop Jimmy Nunn blessed the new space. "God, we consecrate this ground on which many people will find peace," he prayed. He told the worshippers, "People need this congregation. God is just beginning to work in a great new way here." In 2014, St. Luke’s launched an additional worship service at Edmond’s Sequoyah Middle School. Ground was broken about a year ago for the $13 million building project on acreage at 900 N. Sooner Road, just west of Interstate 35 and south of Danforth Road. The growing congregation bade goodbye to its middle school home on Oct. 2. The new facility’s design includes elements that connect it to St. Luke’s Downtown in Oklahoma City. For example: black marble insets along the sanctuary walls and entry landscaping that forms the church logo, a three-cornered symbol called a triquetra. The campus also houses St. Luke’s fourth children’s daycare center in greater Oklahoma City. The complex includes a large indoor playground with a climbing wall and ceiling lights that move and change color, an interactive game projection system, and a 650-gallon aquarium. In a news story published in The Oklahoman on Oct. 15, Long said that St. Luke’s Edmond "has mostly drawn people who weren’t attending church anywhere and others who have recently moved to the metro suburb." Twice on Sunday mornings, worshippers will hear Long’s sermons via broadcast from St. Luke’s Downtown. Josh Attaway is campus pastor at St. Luke’s Edmond. "It’s about offering a place to enrich lives, become better parents and better people — the people God created us to be. How we’re able to use a building to bless lives — that’s what it’s all about for us." 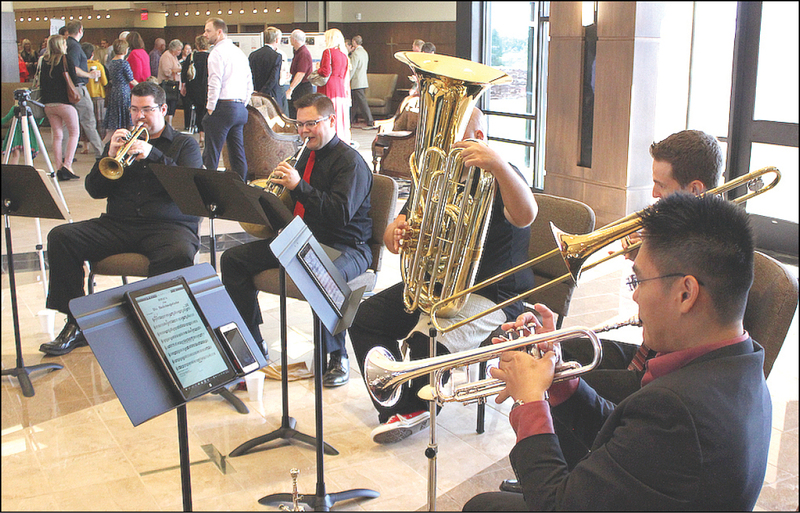 People note the welcome by Boulevard Brass Quintet as they flow into St. Luke’s Edmond UMC on Oct. 9 for the first worship service in the new facility. Bob Long, right, is St. Luke’s senior pastor.